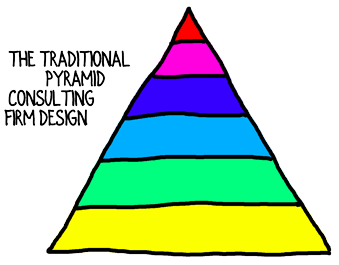 The design of your consulting firm determines your bottom line profit. 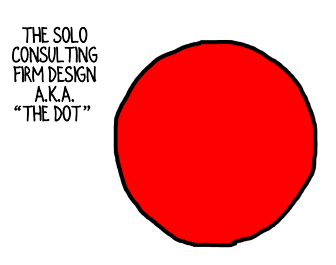 If you’re a solo consultant, you might think that firm design doesn’t apply to you. You’d be wrong. It applies to you too. 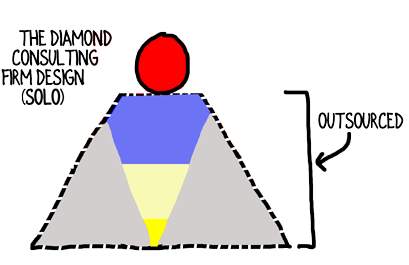 Traditionally, companies resemble an Egyptian pyramid: roughly triangular with slaves clambering all over it. Huge consulting firms follow this model with a few high-paid pharaohs reigning atop a cascade of increasingly junior people. Pyramids work poorly for boutiques—it’s frustratingly difficult to increase net profit while revenue grows, and, of course, pyramids don’t apply to solo firms. Flat organizations are in vogue, which is akin to the pharaoh holding the whip and overseeing the slaves himself. Flat designs cut out the layers of bureaucracy, but introduce a host of other problems. Quite a few boutique consulting firms operate in a variation of the flat organization—the barbell—where the partners hire a cadre of entry-level analysts to take on the grunt work, but leave out the project-management layer. Barbells are heavy to lift and the growth potential is severely limited. The dot describes many solos operators. One person doing everything. Zippo leverage, plenty of stress, modest enjoyment and capped revenue. Other than that, dots are fine. 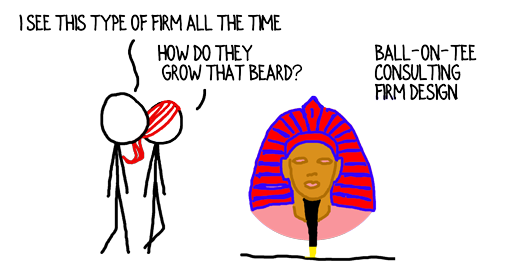 Finally, there’s the golf-ball-on-tee design (frequently described as King Tutankhamen’s** head balancing on his cool beard), which characterizes a solo consultant who brings in a part-time assistant to handle a few basic, administrative tasks. The tee does raise the ball—and potential revenue and profit—up a bit, but most solos are disappointed with how little their bottom-line grows. If none of those designs is the answer to maximizing profit, what is? An ancient Egyptian girl’s best friend: diamonds. 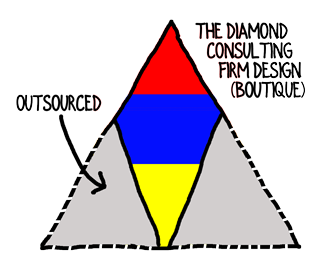 The diamond design focuses on the overseers project-management layer. Strong project-management creates the maximum leverage. The project-management layer allows you, at the top, to focus your energy on what you do best: win business, manage relationships, and add value to projects with your experience and insights. Boutiques: Strip-away the execution, analysis, number-crunching layer and outsource that. Beef up the quality of the project/account management layer. Solos: Add outsourced project-management to your setup. Yes, a virtual assistant is a good step in growing your firm. The next step is adding someone, virtually, who can take over much of your firm’s management and operations. This is a significant investment that will create tremendous leverage and boost the heft of your wallet. For both types of firms, the vast majority of your personal contribution to your projects’ value occurs in a few moments or minutes. That idea may require a huge shift in how you view your role. You currently perform a huge amount of work, but how much of it truly leverages your unique experience and expertise? You offer an insight, a correction, or redirection that you recognize instantly and communicate quickly. That tiny slice of the project is where you create the most value. Almost everything else in your engagements can be outsourced if you stand on a layer of outstanding project management. And that leads me to my question for you: where do you add tremendous value in mere moments or minutes? I’m interested in hearing it and, importantly, by taking a few seconds to identify your source of power, you’ll recognize many more facets of your current business you can pare away to cut your firm into a diamond. Are you able to instantly diagnose an operations problem? See the hidden conflict between employees? Vastly improve leadership’s communication with just a few tweaks to language? Please share. Fabulous article! Very clear. Also helped me to realize that I need to develop visual skills beyond financial graphs. · translating between CEOSpeak and GeekSpeak. Outstanding, Jaime. Now, how can you eliminate everything from your plate other than those three superpowers and the tasks that directly enable them? How can you make progress toward that goal? Though provoking questions Thank you, David. I create most value for clients when I trace operational decisions to bottom line. This process requires lots work with data – collection, processing, analysis, presentation. In a company I am building my role is at the top-level analysis and presentation to clients. The rest will be either outsourced or delegated. That sounds exactly on target, Anatoli. If someone else can manage the project and ensure the dots are polished up for you to connect, then your leverage and value-creation are both maximized. Absolutely, Josh. Your super power is how you create value in the world. It wouldn’t make much sense for Superman to build a business around, say, writing poetry. Maybe Clark Kent composes lovely limericks, but it’s being stronger than a locomotive (etc.) that allows him to save the day.